Two months until THE LOST comes out!!! Very tempted to make a joke about how I lost track of time and am shocked that it's only two months until pub day, but I'll resist. I can't wait for people to meet Lauren and Peter and Claire! If you're a reviewer, librarian, bookseller, or other publishing industry professional, please note that the eGalley (digital advance reader copy) of THE LOST is now available. Click here to request it on NetGalley! For the first hundred miles, I see only the road and my knuckles, skin tight across the bones, like my mother's hands, as I clutch the steering wheel. For the second hundred miles, I read the highway signs without allowing the letters to compute in my brain. Exit numbers. Names of towns. Places that people call home, or not. After three hundred miles, I start to wonder what the hell I'm doing. In front of me, the highway lies straight, a thick rope of asphalt that stretches to a pinprick on the horizon. On either side of the highway are barbed wire fences that hem in the few cows that wander through the scrub-brush desert. Cacti are clustered by the fence posts. Above, the sun has bleached the blue until the sky looks like fabric stretched so thin that it's about to tear. There are zero clouds. Instead, I switch on the radio. Static. For a moment, I let the empty crackle of noise spray over me, a match to my mood, but then it begins to feel like prickles inside my ears. Also, I begin to feel self-consciously melodramatic. Maybe as a sixteen-year-old, I'd have left the static on, but I'm twenty-seven. I change the station. Again, static. And again. Again. First option: an apocalypse has wiped out all the radio transmitters. Second, much more likely, option: my car radio is broken. Switching the radio off, I drive to the steady thrum of the car engine and the hiss of wind through the cracked-open window. I wanted the radio so I wouldn't have to think. I listen to the wind instead and try to keep my mind empty. The other day, I ran across an article called "18 Things Highly Creative People Do Differently" on the Huffington Post. It's an interesting article. Written clearly. Nicely organized. Relevant Getty images. Etc. But it totally stressed me out. But this article listed out the 18 things creative people do... and I don't do them. Not all of them. So I wanted to write this blog post because I believe that you don't have to fit into a particular mold to be a creative person. 3. "They work the hours that work for them." Hah! I wish. It's a luxury to choose what hours you work. I write in the hours that I have. Or minutes. If I only wrote when I was at peak freshness or when I felt inspired... You don't have to wait until the perfect moment to be creative. 4. "They take time for solitude." Quiet freaks me out. I write to music because it distracts the critical side of my brain and allows the creative side to play. But, sure, yeah, I guess I'm more productive when I'm alone? I'm happiest, though, when I am both writing and have my family around me. 5. "They turn life's obstacles around." Art can come from a place of pain. There are many artists and writers who take their pain and transform it into art. It can be part of the process of healing, or it can be a cry in the darkness. But art can also come from a place of joy. I think sometimes people forget that. 6. "They seek out new experiences." In fiction, yes. In real life, not so much. I'm perfectly happy to not be the one to try the spiciest food or leap off a mountain or dive to the bottom of the ocean. My characters can do that for me, thank you very much. Agree with this 100%. You have to be persistent. In fact, if I had to choose one trait necessary for success in writing (and all art), it would be this: Don't give up. Unless you're unhappy doing what you're doing. Then give up and go do something that makes you happy. There's no shame in discovering you don't love what you think you're supposed to love. 8. "They ask the big questions." Hmm, define "big." I ask things like "What would happen if a unicorn stabbed a vampire?" Or "What fun things can you do with telekinesis?" Does that count? You can be the kind of creative type who asks the big questions and explores the mysteries of the human psyche. Or you can be the kind of creative who studies the small moments and captures them in a perfect jewel of words. Or you can be the one who wants only to entertain. Or you can be some mix of all of those. Personally, I am a big believer in "story first, theme later." I've been known to write an entire 300 page first draft and then say, "Oh, so THAT'S what the story was about." Ooh, I do this all time. I wish it were socially acceptable to plop down next to someone and say, "Tell me your life story." Only my grandmother can get away with that. Creatively, yes. I intentionally broke writing rules right and left in Conjured. In real life... not so much. I hate when people are mad at me. And I really don't ever want to break any bones. So in real life, I'm rather risk-averse. 11. "They view all of life as an opportunity for self-expression." Not really. Sometimes I just like to eat tortilla chips and have no interest in making it into performance art. 12. "They follow their true passions." Guess this is true. I'd lump it in with #7. Stubborn persistence is key to success in the arts. 13. "They get out of their own heads." 14. "They lose track of the time." True for me. Especially when writing is going well. Writing can be an immersive experience. 15. "They surround themselves with beauty." 16. "They connect the dots." Guess so. But you don't have to see the connections when you start a story. You just have to trust yourself that it will all connect someday. 17. "They constantly shake things up." The article quotes someone who says (and I'm paraphrasing here) that habit is the killer of creativity. Nonsense. As with all of these, it might be true for some people. But for others... Habit can be the thing that makes you feel safe enough to take the mental and emotional risks that allow you to create. Living in a safe environment, surrounding yourself with people who love and believe in you, avoiding unnecessary angst and drama... that's what gives you the strength to fly. See #5. 18. "They make time for mindfulness." Am I supposed to be meditating? Oops. The article does mention needing a "clear and focused mind," and I do think that can help. But I would like to point out that "clear and focused" doesn't have to mean linear. In other words, you don't need to know what you're doing to do something cool. But you do have to sit down and do it. So those are my thoughts. What do you guys think? Do you fit all 18? 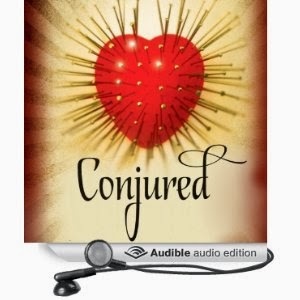 My latest YA book, CONJURED, is now an audiobook!!! It's produced by Audible and narrated by Holly Fielding. I can't express how very, very cool (and admittedly freaky) it is to hear one's words read by someone else. Kind of feels like drawing a picture of an imaginary girl, and then having the girl say hello and walk off the page. The narrator does a fabulous job and hits just the right hauntingly creepy tone. You can listen to a sample here, if you're curious. For almost every one of my books, the process of finding just the right title required sifting through many, many not-quite-right titles. With only one exception, the title I gave the book while writing it was not the one it ended up with. (The exception was VESSEL, which was always VESSEL.) The fact is, titles are hard! You've got all the pressure of naming a new baby -- you know, pick something that can't be mocked on the playground and won't otherwise scar him/her for life -- but you can't go with any traditional names. It's fine to name your new baby girl Emma, but it's frowned upon to name your new book OF MICE AND MEN or GONE WITH THE WIND. It will be coming out in October 2014 from Bloomsbury/Walker and is about a girl with telekinesis. I'll be posting more about it soon! Speaking of soon... my first book for adults, THE LOST, is coming out in less than three months! Eeeeeeeeeeeeeeeeeeeeeeeeeeeeeeeeeeeeee!!! In honor of this, I redid my website to showcase the lovely blue cover: www.sarahbethdurst.com. What do you think??? But it will be soon. I hope. I'm the author of eighteen fantasy books for adults, teens, and kids. Several of these have won awards, including THE QUEEN OF BLOOD, which won the ALA Alex Award, and VESSEL, which won the Mythopoeic Award. My latest book for kids is THE STONE GIRL'S STORY (HMH/Clarion), my latest book for teens is FIRE & HEIST (PRH/Crown), and my latest book for adults is THE DEEPEST BLUE (Harper Voyager). I'm very, very, very excited about this. Sign Up for Sarah's Newsletter! Starred Review in Booklist for SPARK! THE DEEPEST BLUE comes out today!!! THE DEEPEST BLUE comes out tomorrow!